Category: Wah-Wah Brand: Custom Shop. 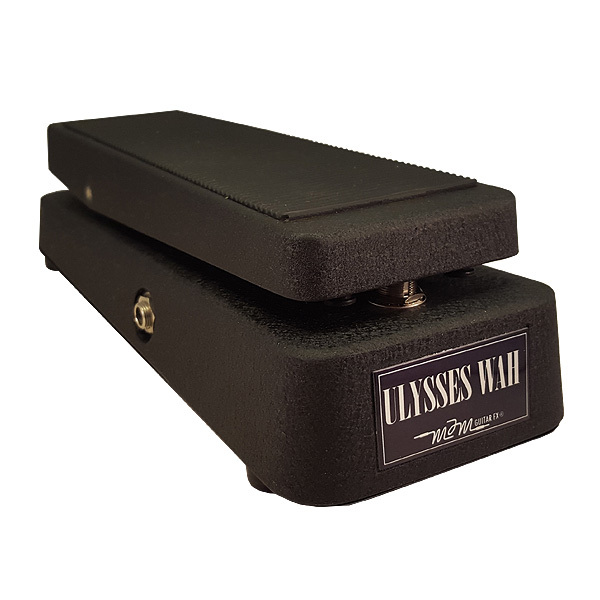 I’ve always loved the sound of the original Clyde Wah Wah pedal but found myself wanting a bit more after listening to many Hendrix and Cream recordings. The wah sound in these recordings always were extremely expressive and seem to have an exaggerated vocality and I surmised that certain elements of the wah circuit had been optimized to attain the particular sound i was hearing. Adjusting the values of certain components did help, but i soon realized the heart of this sound lay in probably the most crucial part of the wah: the inductor. After some trial and error i soon discovered the secret to this wah sound was related to the amount of windings, how winding the wire affected the sound and how even the type of wire being used could alter the actual tone, sweep & expressiveness dramatically. Factored into this equation was certain specific capacitors, namely the’ tropical fish’ caps, which are definitely key components in a killer wah circuit. So begins the story of the Ulysses Wah. I began this quest in 1998 and have refined it through the years. Back then, someone actually hand winding they’re own inductor was seen as an oddity, but i gather today this idea and approach has caught on. Our Ulysses is the closest I’ve heard a wah sound like those recordings I admired long ago (and still to this day). A wah sound that is alive and distinct. The results of all these efforts make for a very dynamic, vocal and expressive wah with a great wide sweep that is full bodied and rich in tone. *Vox is not affiliated with MJM products in any way.